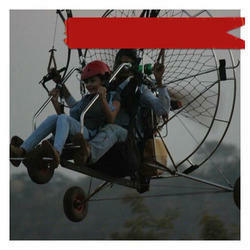 As per the specific needs of the clients, we are engaged in providing a high quality range of Paramotor Flying Machine. In this modern world it is becoming more and more competitive selling a product or making a brand name. Intensive research is being done in various media of advertising. Leading organizations are busy exploring, and executing more and more effective methods of advertising and Flying of Banners Dropping of pamphlets, flowers on occasions for your events. Good condition Paramotor make Parajet, Model Volution Compact, 180CC, Propeller 3-blade full carbon fiber scimitar designe, pilot weight range 80-100kg, fuel tank 10 ltr. 2hr flight time, electric start. Looking for a fantastic and unforgettable sky journey Look no further, we provide you with Paramotor ride which will make you trip unforgettable and memories to cherish throughout the lifetime!! 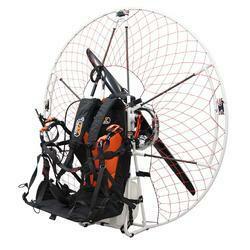 We manufacture EU certified paramotors with imported engines like Radne Raket, Simonini, Thor and Cors Air, Italy. Our units are one of the sturdiest and the ligthest without compromising safety.